Despite having grown up in an era when the Smurfs had considerable cultural cachet, I'm far from a Smurfs aficionado (a Smurfionado?). Every time I revisit the Smurfs' canon I seem to encounter characters that I have absolutely no memory of. Wild Smurf? Sassette? Grandpa Smurf? Who are these Smurfs? 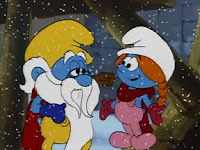 Sure, like most Smurfs, their names pretty much tell you everything you need to know about them but I was still kinda holding out for some of the Smurfs that I remember to get some time in the spotlight. And while Brainy and Hefty get a few moments to shine, Papa Smurf is practically MIA for the bulk of this special's run time. And, once again, Gargamel is nowhere to be found. What the Smurf?